How did it start? Anglo-Australian expat Geoffrey Hobbs, who runs a chain of luxury hotels in Sri Lanka, started a polo tournament over a decade ago in Galle where players rode elephants instead of horses. In 2007, however, one elephant went rogue and smashed into several spectators’ cars. The competition was suspended for several years, finally reemerging in 2013, now played with colorful “tuk-tuk” three-wheel rickshaws, instead of living, accident-prone creatures. The first tuk tuk polo tournament was played in March 2013 at the Galle Dutch Fort, followed by the second one last year, in 2015, and the response seems to be promising. Organised by the Ceylon Polo Club, the game certainly seems to have generated a lot of enthusiasm among foreigners and locals alike, with many people showing interest in the next event, which is happening in Galle, on the 19th of this month. The game comprises of three players per team. Each vehicle is manned by a driver, with the player taking up position in the back seat (while you can handle the horse and the mallet at the same time, the same cannot possibly be said of the tuk tuk. Not unless you want to end up wrapped around one of the goal posts). Tuk tuk polo makes use of the speed and easy maneuverability of the trishaw, the exceptional navigational skills of the driver, and some really brilliant hand-eye coordination from the players, to score by whacking the ball into the opponent’s goal. In spite of its quirky nature, tuk tuk polo comes with its own set of rules and regulations, just like any other sport. Games are supervised by an umpire and are open to both males and females. The game is played in two seven-minute rounds with a 15-minute halftime interval. This year, eight teams competed and the winners took home a grand prize of Rs. 200,000 ($1,430). 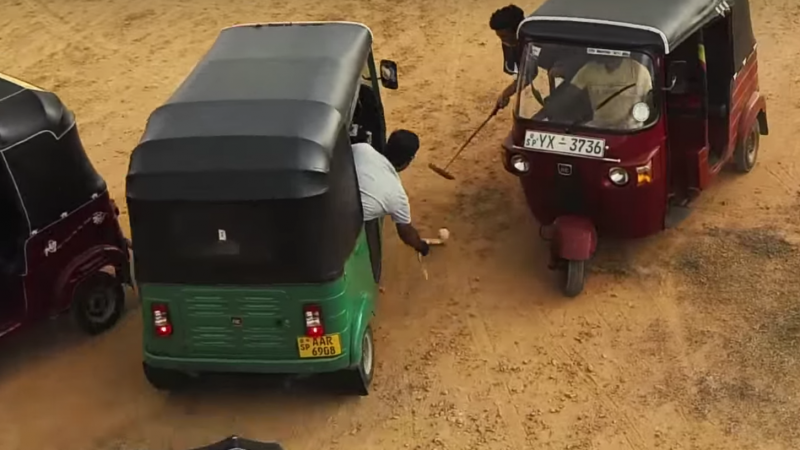 ‘Tuk Tuk Polo’ might be our new favourite game ever. Sorry Prince Harry – we much prefer this version of polo. Animal rights activist Sagarika Rajakarunanayake says she is glad that the game now uses tuk tuks, instead of elephants, given the typically “cruel treatment” they must endure, when used in such events. Those intrigued but not won over entirely by tuk-tuk polo are invited to try tuk-tuk karaoke. For a taste, check out this British expat's adventure with singing in a rickshaw.